For this baby boomer, born in the middle of the last century, it’s disconcerting to lose such basic navigational aids as page numbers. The electronic reading storm has cut their cables, setting proud old page numbers adrift, sinking to the bottom or wallowing in the currents, destined to be cast up on some distant shore called long ago. Will page numbers even be denied their traditional role in footnotes? As I write this, I am gazing at a handsome hardcover of The Iliad resting rather weightily on my desk, admiring its glossy black dust jacket with its elegant gold type, the black ribbon bookmark extending languidly from its creamy pages. I have not read the print version but have listened to the audio recording. So come to think of it, percentage might be more relevant than page numbers here as well. I felt particularly justified in listening to this great work, since it was originally oral and was committed to writing only when it was already an old story. Today, owning the printed version is an affordable luxury I indulge in—and there is no better way to dip into its river of thought than to leaf through its beautiful pages. For years I’ve asked people what they’re reading; these days, I’m also asking how they’re reading. I’ve been hearing some intriguing things. One woman, who has always been an avid reader, told me she reads even more books now just because it’s so easy to get new books on her e-reader. And e-readers do appear to be causing a growth spurt in reading. The Association of American Publishers reports that in 2010, when e-readers were gaining traction, the market for trade books in all reading formats grew nearly six percent from 2008, to $13.94 billion. Most of us have had the experience of just finishing a book and not wanting to say goodbye. Now, with a few clicks, we can be reading another book by that author in minutes. What’s not to love? I asked another reader whether he consults The New York Times bestsellers list in choosing his books. He looked at me as if I were a simpleton. Sampling books with ease may be my favorite aspect of electronic books. When I wrote The Little Guide to Your Well-Read Life: How to get more books in your life and more life from your books back in 2004, I encouraged people to sample many books and be willing to put them aside. I explained the 50-page rule—that is, give it 50 pages and then give it the heave-ho if it doesn’t hold your interest. Too many readers are still stymied by the clean-your-plate mentality—a feeling of guilt if they give up on a book. But I say, if you’re not giving up on at least 10 books a year, you’re not sampling enough—not truly opening up yourself to your rich inheritance as a reader that awaits you. Electronic books make sampling marvelously easy (although now we’ll have to substitute a 15 percent rule for the 50-page). In an ingenious reversal of showrooming (that practice of walking into stores to touch the merchandise, only to go home and order online), I heard from one man who says he samples books at Amazon, decides what he wants, and then walks into his bricks-and-mortar bookstore to buy the print versions. Another blessing of electronic books is that they have solved the space problem. And I’m not referring to the advantage of taking an e-reader on vacation instead of a satchel full of books; I’m talking about your home library. In the print era, many book lovers only with regret culled books from their library. “I can’t add a book unless I’m willing to give one up,” lamented Stanley Marcus when we visited his elegant home in Dallas years ago. And he had a huge library, amassed over his long, well-read life. But now that we can keep track of what we’ve read in a virtual library, such as Good Reads, Library Thing or Shelfari, we can also keep our notes on those books in the bookish cloud, and see them on our virtual shelves; it doesn’t hurt so much to say goodbye to some of the ones less important to us. Besides, if you ever wanted a printed copy again, you could easily find it—a blessing we now take for granted in our post-Internet world. One of the very best practices for a well-read life is to avidly build a library of books you might like to read—your Library of Candidates, as I call it. It allows you to make better choices of the right book for you to read right now, and helps ensure that you can always be in book love. With electronic access, you don’t have to actually buy these books ahead of time and have them on your shelf, beckoning to you (although it’s a sweet luxury if you have the space for it). Instead, you can depict them in your electronic library—your wish library—and then get them virtually in your hands in minutes. How heavenly. So today you can, with an easy mind, fill your home library of printed books with only your very favorites. Today we can each build a privately curated museum of printed treasures. I realize many people are still reluctant to write in their books—Preservationists, I call them, as opposed to Footprint Leavers, like myself. I say: bless you, Preservationists, for your thoughtfulness in imagining that someone else may want to read your book in its original condition someday. But I urge you to turn the page on that particular noble sentiment; with eBooks, people can always read unmarked books. Instead of showing what Anne Fadiman calls courtly love, indulge in her carnal love. Get physical with your physical books—mark them boldly with your name and quirky marginalia; add the dates of when you read your books and where. Upon review, these marks will bring your reading experience rushing back to life and help you retain what you wish to hold in your mind and heart. Interleave ephemera such as ticket stubs to the movie adaptation. Tuck printouts of emails you exchanged on the book, or your own typed review, inside the dust jacket (which makes such a nice little folder). Your hardcover books become personal time capsules—compact, beautiful, and lasting. Know that it’s your personal marks in your books that not only make your book a unique artifact for your own enjoyment, but for the enjoyment of your family members who may outlive you, and for your grateful descendants. In his award-winning history The Swerve: How the World Became Modern, Stephen Greenblatt tells the story of how a canny librarian purchased a marked-up, 1563 Latin edition of On the Nature of Things for a few hundred pounds. When the librarian’s hunch proved correct, the value of the book, both monetarily and historically, was immense. That marked-up book was none other than Montaigne’s personal copy. Of course, most of us will not be historical figures, but we are beloved by our own families, and especially by our survivors. Let’s give them something to talk about—hidden inside the cherished antiques your hardcovers will become. Printed books are declining faster than any projections, according to a major book printer. Bowker Market Research reports that the market share for hardcovers dropped from 46 percent in 2009 to 39 percent in just two years. By the first quarter of 2012, eBooks had racked up more than $30 million more in sales than printed books, according to a report in The Wall Street Journal: $282 million for e, $250 million for p.
Besides, what do you actually own with an eBook? Not the book. That hardcover, on the other hand, is yours to hold and love and hand down. At a dinner party last week, my table mate was telling me about a toddler she saw who ambled up to a coffee table book and swiped her finger gently on the page in an attempt to make it turn. Will we have to teach new generations what pages were, the way we wonder how buttonhooks worked? When we say to a group of young people, “Let’s all get on the same page here,” will they gaze back with a quizzical look? Call me romantic, but I hope the page metaphor will linger. After all, we still speak of turning down the lights (harkening back to gaslight, I suppose) and dialing phone numbers. But it’s not just the metaphor of the page that I hope will live on. Like The Iliad, some pages—physical, bound, well-turned and even annotated—still belong on our bookshelves. How about you, dear reader? How are you reading now? What observations can you share with me? I’d love to hear. Just click on the Comments link below. (If you’re reading this as an email, click here and you’ll connect to Comments). In a downtown office building in Phoenix last month, five librarians answering questions from two visiting CEOs admitted to stealing from businesses. They confessed to violating basic tenets of their profession. And under questioning, they confirmed that other librarians around the country were emulating them, particularly after their alleged misdeeds in Maricopa County, Arizona, won them an Innovations in Reading Prize from the National Book Foundation. The librarians were led by the avuncular Harry R. Courtright, Maricopa County Library District (MCLD) director and county librarian. It was in his office, around a conference table with its 7th-story view of downtown Phoenix that we met. I was one of the CEOs, representing the board of the National Book Foundation, there to check in with past winners of the Innovations prize. The other CEO was Laura Roberts, whose company makes eco-friendly chemical products for other companies worldwide and is a leader in Conscious Capitalism—or capitalism with a conscience. Our mission was to find out how the librarians had managed to pull off their Innovation. “We began by listening to our customers,” said Courtright. Customers? Already I was doing a double-take. What they heard their customers tell them, in physical suggestion boxes in the library branches and virtual ones on the Library District’s website, was that 85 percent of customers arrive at the library with no particular title in mind. They want to browse. Trouble is, the century-old Dewey Decimal System doesn’t make browsing that easy. The Dewey Decimal System doesn’t have a number, for example, for books on weddings. So a customer coming in to get help planning a wedding has to look under flowers 745.926, and wedding cakes 641.8653, and maybe etiquette 395.22. But customers planning a wedding just want to go to a wedding section. So the librarian leadership in MCLD thought the unthinkable. What if they threw out Dewey? This professional blasphemy ruffled feathers. Some librarians accused leadership of dumbing down libraries. But the librarian leadership was fired with derring-do, and they decided to go ahead with their plan to do away with Dewey. Gently. “When we had the chance to fit out the new Perry Branch Library in Gilbert, we decided to try to do it without Dewey, and we wanted to see how far we could rethink the whole library experience,” said Courtright. The building in Gilbert, a suburb of Phoenix, had been designed for a traditional library. Courtright and his cohorts were undeterred. “We studied retail stores and adopted the way bookstores organize books according to subject areas. And just as retailers know that eye-level merchandise is what customers see and buy most, we put our focus there,” said Courtright. ﻿﻿I knew that librarians keep careful track of their inventory and circulation. But as a merchant, I was impressed to hear the Maricopa outliers talk about book lending in terms of stock-keeping units (SKUs) and how frequently you turn over your inventory. The Perry Branch was slated to hold 75,000 books. By the time the library thieves got through putting into action the ideas they stole from retail, the branch housed a mere 45,000 books. The old library model had separate desks—Circulation, Reference, Children’s. The Dewey-less Perry Library has one big desk in the center called Customer Service. While some of the librarians sit behind the desk, others engage in even more derring-do. They roam. “We have roving librarians who walk around looking for customers who seem confused and ask, ‘May I help you with something?’ It’s a completely different attitude from the shushing librarian of the past,” said Courtright. Technology helps, too. With new self-check-out and check-in machines, customers can perform these clerical functions themselves, saving librarians for more meaningful interactions with customers. When Courtright’s group outfitted their Dewey-less library, they bought fixtures not from library-supply companies but from retail-supply companies. They made the shelves lower and put more of the books facing out, optimized for browsing, rather than spine out, typical for high-density libraries. “When we opened we didn’t know how customers would react, so we sent extra staff over there on opening day just in case. By lunchtime, we sent them home,” said Courtright. Turns out that customers were quickly comfortable, even if librarians were not. After their initial success, the MCLD librarians began rolling out the redesign to other branches. Once again, circulation and customer satisfaction went up. The first Dewey-less libraries were converted conventional libraries, but soon the librarians had a chance to design a building from scratch in the far reaches of their district, out at the edge of the Sonoran Desert and the White Tank Mountains. The librarians teamed up with the Maricopa Parks and Recreation Department to locate a nature center inside—and outside, along walking paths. They brought in the local firm of DWL Architects+Planners to help further rethink what a library could be. The result is known as the White Tank Library & Nature Center. The design embraces green technology and received the Leadership in Energy and Environmental Design (LEED) Platinum certification from the U.S. Green Building Council. Going green in the burning desert is something of a hat trick, given normal air-conditioning requirements. The library’s roof is blanketed with solar panels. Deep roof overhangs and structural fins in the architecture deliver both panoramic views and protection from the savage heat and blinding sunlight. Fully 27 percent of the library’s energy is supplied on site. When facility energy demand is low, this place for quiet contemplation supplies energy back to the grid. CEO Laura Roberts, who uses the principles of Conscious Capitalism to help business leaders think more broadly, praised the librarians. For myself, I wish I could sit for a while in the White Tank Library and contemplate the refreshing oasis of wisdom it represents. Far from the Washington din over government waste and corporate malfeasance, I’d like to sit, appreciating the view, and relish for a moment this example of things going very right in a small but beautiful piece of the Arizona desert. How about you, dear reader—do you know of a library that’s changing the look of libraries? I’d love to hear. Just click on the Comments link below with your submission. (If you’re reading this as an email, click here and you'll connect to Comments). The twelve-year-olds were hot and boisterous funneling back into their classroom after lunch recess. They had been dodging balls and swinging on bars out on the playground of crushed granite. Standing at the door, shooing them inside, was a gray-haired woman with a kindly smile. She had little trouble because the kids knew it was time to hear her read the next chapter of the book that had captured their imagination over the previous weeks. When I started in Mrs. Geissler’s class I hadn’t been doing well in school, nor was I much of a reader. I spent more time watching Batman and the space program on TV, listening to my transistor radio, and annoying our unfortunate neighbors with my new trumpet. But Mrs. Geissler’s reading of Island of the Blue Dolphins caught me. For the first time, I was in book love—I couldn’t wait to hear what happened next. What led me to recollect this long-ago time was Facebook. Through Facebook, I reconnected with former classmates from my San Miguel Elementary Class of 1966. We got to reminiscing and lit upon the subject of Mrs. Geissler’s after-lunch readings. I remembered only a few details of the book—that an island girl and her brother had become stranded on an island, that he had died, and something about dogs. Mostly I remember the feeling of the story. There was beauty and desolation, and the girl had to do everything herself or die. It occurred to me during these Facebook exchanges that I should read the book again—42 years later—and see what I thought of it today. Because I’m such an audiobook fan, and because originally we heard the book, I downloaded Island of the Blue Dolphins from Audible. Also, I ordered two copies of the printed book—an original 1960s-era version with its familiar dust jacket, and a modern hardcover, beautifully illustrated by Ted Lewin. After I hit play on my iPod, it took only moments to be taken in again. A few bars of music set the stage and then the magical voice of Tantoo Cardinal carried me back to the island that had captured my imagination as a lad. Cardinal is a Canadian film and television actress, with Dances with Wolves and Legends of the Fall to her credit. Her first-person reading of the young Karana is perfectly cast. As for the writing, it has a spare, simple, E. B. White style that is well-suited to a story as it might actually have been told by a young Native American. As an adult, I can see why the book has lasted. It deals with enduring themes of wilderness versus civilization, peacetime and war, lives balanced with nature versus nature’s exploitation, gender prejudice and smashed stereotypes. When he penned this tale, the author Scott O’Dell was in his 60s. He was a career newspaperman and local historian. He had sailed the waters off the California coastline and heard a story of a young girl who had been stranded on her island. The Island of the Blue Dolphins was his first children’s book and it won the Newbery award in 1961. He wrote plenty of children’s books afterwards, but this remains his most well known. I see from the old dust jacket that O’Dell had lived in Julian, California, a few miles inland from our school. He could have driven over after breakfast and visited when Mrs. Geissler was reading. How do you thank a teacher? It was in Mrs. Geissler’s class that I started, for the first time, doing well in school. We had to write a paper on a country. I chose Mexico and got an A. Another student accused me of being “a brain.” It was the first time anyone had cast such an aspersion my way, and it shocked me. Mrs. Geissler gave me my first drink of literature and it was salty and wild tasting. It came with the sound of waves crashing and the iridescence of clothes made of cormorant feathers. My classmate Paula looked up Mrs. Geissler in school records and found she passed away in 1978, long before I thought to thank her. Now I’m buying Island of the Blue Dolphins for some parents I know. Perhaps if they read it to their children, they too will be transported. Have you re-lived your first book love? I’d like to hear your story. Just click on the Comments link below. (If you’re reading this as an email, click here and you’ll connect to Comments). For the inauguration ceremony, our staff at Levenger headquarters here in Delray Beach, Florida, gathered in a conference room. The live coverage was projected onto a screen we normally use for business presentations. Lori and Janet, our executive assistant, brought in two trays of cookies with dozens of little American flags, and were met with lighthearted laughter and applause. People snapped up the flags to wave or just hold. We sat or stood, mostly in silence, watching the ceremony and listening to Obama’s inaugural address. As in so many other conference rooms and family rooms across the country, our staff clapped and sighed and wiped their eyes. Someone handed me a tissue. I felt proud of our country for its peaceful transition of power, and proud of the powerful symbolism that Obama represents for America and the world. After work, I went to my regular weekly tutoring session at the Village Academy, not far from our headquarters. The Academy is a public school whose mission is to support its surrounding community of mainly lower-income families. The Academy offers classes for both youngsters and their parents, many of whom have recently immigrated to America with their children. In the evening, while their children attend after-school programs, those parents who can spare the hours from their jobs come in to work on their English in free classes and one-on-one tutoring. On this night, a group of nine parents—all recent immigrants—traveled by bus the few miles to Delray’s downtown public library for a tour. They were escorted by staff members of the Palm Beach Literacy Coalition and Americorps. The new immigrants, men and women, were from four countries: five from Haiti, two from Nicaragua, one from Mexico and one from El Salvador. They sat on a beautiful long wooden bench with stainless steel appointments, in the lofty lobby with bamboo trees, slate walls and a waterfall nearby, while Norma Kane, the library’s community relations assistant, gave a bit of history. She explained that the library began in 1913 and was established by the Ladies Auxiliary on the second floor of the old town hall. She didn’t mention that for its first decades, blacks would not have been welcome. Nor was this the only library that had such a policy; it was prevalent in parts of our country as recently as the 1960s. Norma explained to her guests that all the books, audiobooks, DVDs and CDs were free to check out, and that all they needed to do to get their own library card was to show some sort of photo ID—or even a bill with their name and address. The library is proudly unconcerned with anyone’s antecedents or status—east or west address. After Norma’s talk, library volunteers divided the visitors into two smaller groups to tour the library. They went to the quiet study rooms, saw the dozens of free Internet terminals (all busy, as usual), greeted the reference librarians, saw the foreign-language sections and explored the children’s library, where they could bring their children for story hours. Afterwards, the new immigrants lined up to receive their library cards before boarding the bus to return to their children. The success of our economy has always depended not just on the size of our Gross Domestic Product, but on the reach of our prosperity; on our ability to extend opportunity to every willing heart—not out of charity, but because it is the surest route to our common good. Because of our country’s belief in a common good, our lovely Delray Beach Library is able to extend the opportunities that literacy brings to every willing heart. It has been a good week. I am proud of this small community and this big country called America. How about you, dear reader? I’d like to hear your thoughts about our new chapter. Just click on the Comments link below. (If you’re reading this as an email, click here and you’ll connect to Comments). In case you’re resolving to get more books into your life this coming year, I list below nine ways to do so in 2009. Many are rather new, made possible by technology. Two are old, although powerful in ways most of us fail to truly understand. Buy or borrow an Amazon Kindle, a Sony eBook or similar device (there will be some new models out this year) and read at least one book this way in 2009. Most early adopters like the devices and many have reported that they read more books because of the ease of carrying a little magic book that can be almost any book. See if it liberates you, too. So much of reading is sharing your thoughts with others. It’s never been easier to find people you want to talk to and books you want to talk about. Shelfari, Good Reads, Library Thing, Visual Bookshelf in Facebook—all are dedicated to communing with books, and hence, with ideas. There are other ways as well. Email an author on his or her website. Google a book title and you’ll find blog posts you can respond to. 1. Try great stories, mostly fiction or narrative nonfiction, like David McCullough. 2. Listen when washing dishes, folding laundry, washing cars, anything mindless but handful. 3. Don’t think driving is the only time; it’s not even necessarily the best time for audiobooks. 4. If you don’t love your first listen, try two more before giving up. Even if you think audiobooks aren’t for you, even if you know you prefer reading with your eyes rather than your ears, please give audio a chance. Homer would approve, and Shakespeare, too. Watch the movie first, and then read the book. Why do it backwards? Because it can be better this way. Ideal reverse boovie candidates are highly rated movies adapted from big novels. The more you like the movie, the more you’re likely to love the depth and dimension waiting for you in the original book. I know watching the movie first sounds strange, but don’t reject it just because it seems wrong. Lots of things seemed wrong in the beginning, like heavier-than-air flying machines. Get yourself a library card, check out those five promising books, take them home with the expectation that you’ll taste all five…but finish only one. At home, begin each book and try to make it to page 50 or so. If you can put it down, do so. If you can’t put it down, don’t. Finishing one of the five is your benchmark for success. You will have not only enjoyed a brand new book in its entirety—a book you’ll likely be raving about to others—but you’ll have practiced two important lessons for those leading their well-read lives: using a library well and giving up on books you don’t love. Therein lies a path for finding those books that will change your life utterly. We’ve passed the peak of the golden age of a bookstore on every corner. But many of those still with us have become the village wells of their non-virtual communities. Go enjoy them. Browse, chat with the booksellers, get the physical feel for books that’s still hard to achieve online. It’s as much about the experience as it is about the books. Have one of your best friends choose a book for the two of you to read. Then get together in person and have something else to talk about, and grow your friendship yet more. Do the same with a special teenager you know—only this time, you choose. I’m recommending our Levenger Press book, A Boy at the Hogarth Press, a charming coming-of-age memoir from an earlier age. This is as old as human language—storytelling, that is. It’s at the very heart of what it means to be human, and it’s why so many older people cherish it. It’s not because they have trouble reading, which they may, but because they realize in their bones that hearing another human tell them a tale is one of the rooms of heaven. Any one of these suggestions could be the key that unlocks the magic door for you to take your life to a higher plane—not only in 2009, but in every year following. Let me know what sparks for you. Just click on the Comments link. (If you’re reading this as an email, click here and you'll connect to Comments). I was intrigued to see what Spain’s libraries offered its citizens since, according to the most recent comparative study of library funding (Libecon Data by David Fuegi and Martin Jennings), Spain is grouped among the Very Low Spenders. This group also includes Bulgaria, Hungary, and Romania. 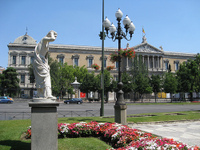 Our first library was Spain’s most prestigious—its national library in Madrid, which shares space with a museum. Outside it is majestic, with tall iron gates and soaring statues of Cervantes and other Spanish luminaries. Inside, we could get only so far. Unlike America’s Library of Congress, the Biblioteca Nacional does not allow just any turista to walk in and have a seat in the reading room. Instead, we were directed downstairs to a museum open to all. It held a fabulous exhibition on the history of language. We could absorb only so much since there were no English translations, but still, it was worth the visit. Next we visited Segovia and discovered that the public library had taken up quarters in the city’s old prison. Located on a busy shopping street, the edifice was under repair. Inside, the rooms are a bit chopped up— perhaps not surprising, given the building’s original purpose. No spaces could be called inspiring, but there were uplifting quantities of books, computers, music and movies, and colorful reading areas for children. Traveling next through the wine region, we saw few libraries. Finally, at one town hall I spotted a sign up on the second story in delicate script that read “Biblioteca Ciberteca.” Up a darkened staircase, we discovered a windowless room lined with bookcases and half a dozen computers. Like libraries I’ve visited the world over, the people inside were busy at the computers, hardly taking the time to look up at unlikely visitors in cycling gear. While you can find public libraries in Spain if you look for them, what I didn’t see in our random wanderings were actual buildings devoted to libraries. Such single-purpose buildings have been common in the United States for a century and also in Egypt and Chile. What we did find were book fairs. On the same week that bulls were chasing people in the streets of Pamplona, people were chasing books in the streets of San Sebastian and Segovia. The Segovia fair seemed especially popular with children, and many booths had steps to allow little people to peruse books alongside their elders. The Spanish bookstalls that Hemingway so lovingly described in For Whom the Bell Tolls seem to have survived into our present century. The World Factbook reports the literacy rate of Spain at 98%, just a point below that of the United States. Libraries, admittedly, are only part of a nation’s learning and reading infrastructure. And the Spanish were reading. When they weren’t cheering their soccer team on to win the Euro Cup, or their Rafael Nadal to take Wimbledon, many were turning pages of books—in parks and cafes and on the beach. The bookstores in Spanish cities reminded me of those in the U.S. a generation ago, small and un-chained. As for those nations in the Top Spenders group for libraries, they spend more than 39 euros per capita, or about twice what the U.S. spends. Who are they? Denmark, Finland, Iceland and Sweden. I haven’t seen what libraries look and feel like in those countries. Have you? I’d love to hear your experiences in libraries in Scandinavia, and everywhere around our learning planet. Just click on the Comments link below. (If you’re reading this as an email, click here and you'll connect to Comments). Our discussion is on Room to Read, the nonprofit organization that former Microsoft executive John Wood founded to combat global illiteracy by building schools and libraries in the developing countries most in need. There’s more on Room to Read’s founding principles in Part 1 of this post. Room to Read staffers maintain a close connection to the children, parents and teachers the program reaches out to. Rather than imposing its ideas from afar, the organization develops its ideas “on the ground,” framing them within the cultural context of the communities it’s reaching out to. As an example, Wood and his staff recognized that for economic and cultural reasons, girls are often held back from school, whereas boys—or at least older boys—can attend. Yet an educated girl can often deliver a higher return on investment, in that she is more likely to stay in the community and teach others. Happily, the cost for an average annual scholarship for a girl is quite affordable by American standards. For $250, a donor can pay for tuition, books and even a uniform. In return, a young girl who may someday be teaching her own children to read can become an educated woman. Another example: while Web-connected computers can indeed offer great gains, so can old-fashioned printed books, which at present are easier to scale. In Cambodia, for example, Room to Read libraries combine computers in labs with books in laps. The unprecedented volume of new books published in English is an opportunity for driving costs down and availability up. The Scholastic corporation has been a particularly generous supporter of Room to Read, donating hundreds of thousands of books. Of even greater importance, though, is that students learn from books in their native languages, so Room to Read has developed a local language publishing program. In less than six years, the program has published 2 million books. John Wood and Room to Read demonstrate what can be done, both quickly and effectively, to improve global literacy. Its success has required an understanding of history, including the proven power of enabling change versus just providing cash. It has also taken an understanding of sound business principles, and more specifically, of entrepreneurial techniques. Recent business books such as Chris Zook’s Profit from the Core and Jim Collins’s Good to Great demonstrate that focus on a relatively narrow set of competencies leads to long-term success. Room to Read follows this wisdom by being clear about what it does—and does not do. For example, Room to Read does not help coordinate volunteering in local countries; rather, its website suggests a few organizations that specialize in that worthy work. Nor does Room to Read handle book donations, despite Wood’s first experience doing just that. Instead it defers to Better World Books, which specializes in the logistics of collecting and transporting used books around the planet. The magnitude of global illiteracy is daunting, and even Room to Read’s impressive accomplishments are still small. Yet its success shows how quickly improvements can be made when well-educated, highly motivated people get to work. I’ll be reporting on other promising forces aiding global literacy and would like to hear from you. What do you see? Just click on the Comments link below. (If you’re reading this as an email, click here and you'll connect to Comments). Globally, 115 million school-age children do not attend school. An estimated 770 million people, roughly one-seventh of the world’s population, lack basic literacy. Two-thirds of these are women, which sets up a vicious cycle, since it is mainly women who teach young children. These statistics could be reason enough for despair. Yet there are also new reasons for hope. Well-educated, highly motivated people are using the tools and capital of the developed world to help children in the developing world leapfrog to literacy. These people collaborate with equally talented and passionate people in the developing countries to create effective co-investment projects, linking the richest countries with the poorest. One such person is former Microsoft marketing executive John Wood. 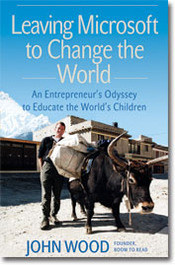 In his highly readable account, Leaving Microsoft to Change the World: An Entrepreneur’s Odyssey to Educate the World’s Children, Wood tells the story of his transformation from globe-trotting software executive to charity founder. 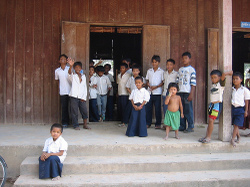 His nonprofit organization, Room to Read, is one of the most effective organizations for educating children in the developing world. And it is growing at the speed of a Wall Street darling. Like many fortunate Americans, Wood had the advantages of growing up in a family that valued education. Positive school experiences were reinforced with trips to his local public library in Athens, Pennsylvania. His bookish cradle left a lasting impression. “This love of reading, learning, and exploring new worlds so predominates my memory of youth that I simply could not imagine a childhood without books,” Wood writes in his book. His formal education included an MBA from Northwestern’s Kellogg School, but by his account, Wood may have learned even more about business during his years at Microsoft—including the habit of focusing on business models that can be scaled up. Wood learned firsthand how a team of people with focused concentration, and quantitative measures ever in front of them, could achieve impressive growth. He also read history and learned how business growth principles have been applied in charitable work. There was Andrew Carnegie, whom Wood describes as “my own personal hero,” because of the many libraries he built a century ago. Closer to present times, Wood was inspired by former President Jimmy Carter’s campaign against guinea worm disease, which resulted in a decline from 900,000 cases worldwide in 1989, to fewer than 30,000 in 1995. Further reading and interviews gave Wood an understanding of the magnitude of global illiteracy, and also of the pitfalls of some conventional charitable organizations. It wasn’t uncommon for a large portion of donations to be absorbed in administrative overhead, nor for tangible results to be at worst illusory, and at best hard to quantify. Simple to understand: Room to Read donations build schools, libraries and computer labs in countries that need them most, including Nepal, Vietnam, Cambodia, Laos, Sri Lanka, India and, most recently, South Africa and Zambia. Co-investment model: Like Andrew Carnegie’s library model, funds are approved only when local communities contribute land, labor and the means for ongoing support. Inexpensive: Despite the current economy, U.S. dollars still go a long way in the developing world. For a few thousand dollars, individual donors can fund a whole library or school. Focus on quantifiable results: Room to Read has built more than 5,100 libraries since the organization began in 2000. Low overhead: Administrative overhead is limited to 10%. Accountability: You can read Room to Read annual reports and its Monitoring & Evaluation (M&E) reports on the organization’s website: www.roomtoread.org. Building upon this solid business foundation, Room to Read makes effective use of Microsoft-era marketing techniques, including email networking and online donations. Wood has rightly received much attention, as journalists and foundations recognize that Room to Read’s represents something good going on in the world. In Part 2 of this post, we’ll look at how Room to Read applies some best business practices to doing good in a sustainable way. But first, I want to hear from you. Do you agree that as a highly literate, developed nation, Americans should support global literacy? How about here in the U.S., and in your community—are there literacy programs you know of that are particularly effective? Walk into just about any public library in America and you can find the names of local citizens who contributed to the library. Yet one name appears more than all others. It is not the name of a local citizen at all, but of a small, bearded, nineteenth-century immigrant who became America’s iconic steel magnate, Andrew Carnegie. Carnegie’s foundation required that local communities come up with the land, the books and the operating budgets, but they could build the libraries in whatever style the local community approved. The offer was irresistible to most municipalities in a country still rushing to settle itself, and nary a town that applied for a library was turned away. They used Carnegie funds to build fine, lasting buildings that have sheltered generations. Most Carnegie libraries, old enough to celebrate their century marks, are still in use today. Carnegie was the quintessential American success story. As a boy, working long hours at his job, he was overwhelmed by the generosity of a retired merchant named Colonel Anderson, who lent his personal collection of some 400 books on Saturday afternoons to local boys. This was how Carnegie educated himself. It was from this life-altering experience that Carnegie would conclude decades later that there was no better use of his money than to build libraries so that others could benefit in similar fashion. He began in his native Scotland, where he provided the funds for a new library in the town of Dunfermline. The opening of the beautiful stone library, on 25 August 1883, so pleased Carnegie that he set out to repeat the process—again and again, and with a passion. Photos of the original interiors of the Dunfermline library from Blaikie’s website show some scenes still familiar to today’s library patrons—racks for periodicals, reading tables and children’s rooms. Other aspects seem curiously quaint—such as separate reading rooms for women. “Whether or not Andrew Carnegie is remembered as a Gilded Age robber baron or the father of business philanthropy probably depends upon which side of the economic tracks you hail from,” observes Les Standiford, the author of Meet You in Hell: Andrew Carnegie, Henry Clay Frick & The Bitter Partnership That Transformed America. “But such debate aside, it is undeniable that Carnegie is as responsible as any modern individual for the very concept of the free public library. “While he imposed no stipulations as to size or style of architecture, the Carnegie Library was often the most imposing structure in a given community,” Les adds. One structure in particular stays in Les’s memory. 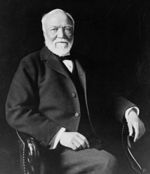 Carnegie spread most of his largess in his adopted America, but he funded libraries in all the English-speaking countries of his day, including Canada, the United Kingdom, Australia and New Zealand. It’s ironic that cacophonous steel mills produced so many quiet reading rooms. How many millions of readers and writers over the years have enlightened themselves in those quiet sanctuaries? How many even today tap quietly at computer keyboards inside those same spaces? Do you have an experience to share involving a Carnegie library? Please let me hear from you. Just click on the Comments link below. (If you’re reading this as an email, click here and you'll connect to Comments).